Description: OpenSS7 Hardware Selection ACB56. The ACB56 cards are single V.35 56/64kbps synchronous cards manufactured by SeaLevel Systems and distributed by ICS. The figure below shows a picture of the ACB56 card. The driver for the ACB56 card rpovides, CH, SDL or SDT access to the card. The CH or SDL driver places the Zilog part into transparent mode and passes octets directly off the line to the channel or signalling data link driver. The SDT driver places the Zilog part into HDLC mode and performs SS7 HDLC using the Zilog SCC. The SDT driver performs better, of course, than the CH or SDL drivers, however, the Zilog SCC HDLC is incapable of performing some SS7 functions that are provided by the OpenSS7 SDT (SS7-HDLC) module for the CH or SDL drivers. 1 x V.35 56 kbps or 64 kbps synchronous port on DB-25 connector. DB-25 to N-type cable available. 56 kbps or 64 kbps DTE mode. Based on Zilog 80585 Serial Communications Controller (SCC). Also suppots RS-232C although not usefule for SS7. Provides V.35 interface where necessary. The ACB56 card has few advantages. It only provides low-cost V.35 interface where absolutely necessary. Any other V.35 capable card might be a better choice. Limited number of cards per host due to ISA IRQ and DMA limitations. Does not support TDM voice channels. Due to its disadvantages for SS7 applications, another V.35 card (PCI or cPCI based, higher density, integrated CSU/DSU) should be considered where V.35 interface is completely necessary. 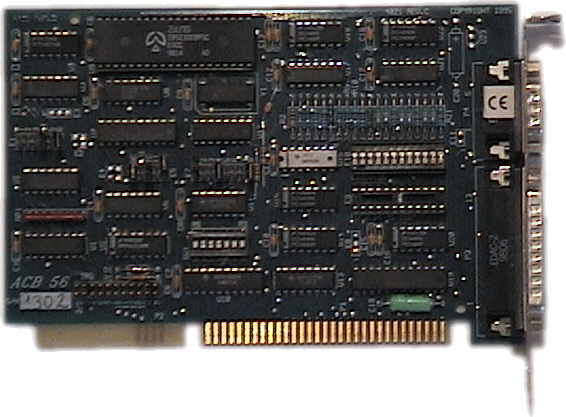 Most SS7 applications do not have a requirement for V.35 interface and this card is not used on the most deployment platforms. If V.35 interface becomes a requirement at a later date, a different card will be selected. The selected card will have a higher density, PCI with PCI DMA and bus-mastering, integrated CSU/DSU, and other features absent from the ACB56 card.